The eforia, Dieuthynsi Oikonomikon Ypiresion/Διεύθυνση Οικονομικών Υπηρεσιών (DOY/ΔΟΥ) or Greek tax authority offices are easily found in map books available for purchase at any periptero (kiosk), with their locations marked. If for some reason you do not own one or cannot read Greek, please find them below. All business is done in person and in Greek. There is no central or official eforia website in which to conduct business online or download forms because each municipality is only responsible for providing an informational site. All transactions require an ΑΦΜ/AFM (ah feh mee) or Greek tax ID number, which is different than an AMKA or Greek social security number. The Ministry of Finance offers limited information and services at www.gsis.gr in Greek. Filing taxes online can be done at taxisnet.gr, also only in Greek. On July August 8, 2011 the government began reducing the number of tax offices, then closed 49 locations on October 22, 2012; 51 more on January 14, and 19 island locations on June 17, 2013. In the future, no transactions with taxpayers will be handled at remaining locations. All documents, certificates, licenses, receipts and tax filings will be done electronically or at 99 Taxpayer Service Centers (KEF) within/near KEP Citizen Service Centres to replace 127 withdrawn tax offices. All payments will be processed electronically or by banks. *Article last updated January 1, 2014. Currently being updated with new information to reflect closures; it is not difficult, just time consuming and tedious. Depending on who you believe, there are between 213-345 tax offices in Greece. Kathimerini says 213 or 290, Naftemporiki says 241, official government websites say 285, Ta Nea says 288 and Ministry of Finance employees I contacted say 223 and 345. Discrepancies are common, and a variety of sources were used to independently verify the information contained in this post. 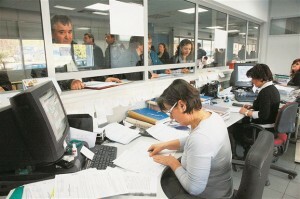 After the reduction, there will be only 30 to 75 114 offices across the mainland and Greek islands. DOY/Eforia/Greek tax offices are lawfully obligated to open from 7:30 to 14:30. However, staff are only required to serve the public 5.5 hours a day, so many locations open later and stop waiting on people as early as 13:30 on a daily basis or may restrict access on Friday to accountants and lawyers. To which location should I go? If you are married, partnered or living with someone who already has an AFM and AMKA, he or she should be able to direct you since they are legally required to be registered with an office closest to his/her residence. If you are single, the best way is get out a map book and see which location is situated closest to your home. You could also call KEP at ‘1500’ and inquire, ask a nice neighbor or call the mayor’s office (dimarxeio). Residents are expected to transfer to the new municipality after a move, since all bills and documents relevant to taxes (i.e., car license, AMKA, audits, social solidarity benefits, tax forms) will continue to go to your old address. This can be done through a KEP Citizen Service Center with minimal bureaucracy. By October 2013, all tax offices are expected to be linked to a new TAXIS system and central database, making it possible for residents to visit the location of their choice, not just the one local to their registered legal residence. The Ministry of Finance said 51 had been connected as of July 1 but did not provide a detailed listing. All tax questions should be directed to the office nearest you, an accountant or a tax attorney. Tax laws are highly complex, change often and are applied according to citizenship, residency, origin/level of income, number and types of assets, marital/family status and other factors. There’s no way I or any generalist can answer your questions without sourcing a number of private details. If you do not wish to look through the entire list, you can use your browser to find what you’re looking for. Go to ‘Edit’ then ‘Find’ and start typing the name of the city or municipality of your choice. All matches will be highlighted. *Please note that there is no office on Lykourgou as some sites report; the one on Metsovou Street replaced it in 2006. 25th Mαrtiou 36 & Ach. Symbol. “Τηλεφωνικός κατάλογος ΔΟΥ Ελλαδος” — *Special thanks to Maria for providing this link, which allowed me to expand this list to the whole of Greece. A very useful post this is… although I would strongly recommend AGAINST any non-Greek speaker attempting to interface with a tax office in this country. The Greek IRS is one of the most notorious branches of the Greek government — staffed by surly, uncooperative, hostile “civil servants” with an ax to grind against the world and, particularly, victims who show up on the premises and at the counter. If you are not a “native” and are unfortunate enough to open business with the “eforia” then seek help from a local person with the patience and the skills to navigate the perilous narrows (and also judge when a little bribe is due). The expat Greek tax office is the one on Metsovou. Unfortunately, I have personal business with them and discovered they had moved from their old location near Omonoia square in 2006. Ted – On the first note, it IS difficult for an English speaker to engage business at the eforia (tax office). I won’t say it’s impossible because I did it both as a business owner and an independent for many years without knowing much Greek to deal with such things — Greek school doesn’t exactly teach you tax lingo and I had no particular talent, just stubbornness. I have also never bribed anyone. I chose (was forced) to do it alone because my friends all work full-time and having a Greek accountant “hold” my books cost nearly 1/5 my salary; basically, it was a choice between having someone hold my books or having food every month. Once I figured out what forms to fill out and when, it was fine and I was never audited. The first year, I had an “accountant” do my year-end taxis and wanted to check if he did it right, so I pulled out a Greek dictionary to translate the form, found out he did it wrong and started doing that myself also until I found a reputable accountant. Very useful info for the expat’s office, I’ll make the correction. On a related subject, there is an English portal of the Greek Citizen Service Centers (KEP). Although the English-language side is far from being as comprehensive as the Greek part, it could be useful to an English-speaking person engaged in battle with the Greek dimosio (good luck). I do not offer links to KEP’s articles because I did my research and found that both the English (very incomplete and full of jargon) AND Greek versions contain errors, thus making it an unreliable source. While some info may be better than no info, I believe giving the wrong info is also damaging. I’ll be happy to change my mind if the site changes. There are other sites offering “articles from experts” such as lawyers, and I won’t offer those either because they are not only wrong, but carry the intention of attracting the business of foreigners who do not know any better. Most of the articles are direct translations of the Government Gazette and aren’t based on any first-hand experience with the process, some articles contradict each other. Tip: If a lawyer has time to write articles, how good could he be? Good lawyers don’t place articles or advertisements because they’re too busy practicing law! The problem with people writing about something they’ve never experienced (lawyers, KEP or otherwise) is they don’t know if it’s true to fact or not. I realize it’s not fair, but talking about a glass a water is not the same as drinking it. Just a small correction on the address of Aigaleo tax office. It moved a few years ago to Alatsaton & Kifisou. According to Google the exact address is Alatsaton 93 & Kifisou 44. Maria – Thanks a million for that correction and useful link; the list I had from last year still shows the address I originally had. I’ll translate, check the others to verify they’re correct then list other offices for the whole of Greece. You’ve always been helpful and I’m grateful for that. Just wanted to say thank you for an excellent website, don’t know how many tears of frustration you have saved me with your site! A word of advice to everyone, make sure you go to the tax office you belong to! Also, staff are extremely rude when you don’t speak Greek. If you live in Kolonaki for instance you belong to the “I” tax office, which is located on the 3rd September Road, do not even think about going to the Omonia “KB” (Komondourou street) office or you will be shouted at like when you accidentally burned your mother’s curtains. Oh, and if like me you are happy enough to have expat parents and therefore happen to have been born in a third country (i.e. neither Greece nor your country of citizenship) be prepared for a process worse than the Spanish Inquisition. Nelson, your post really made me laugh (especially the part about the curtains!) because everything you said is too true, except in the rare case you meet someone sympathetic and kind, such as when I signed up for my AFM (though I suspect the clerk had a crush on my taxi driver). Anyway, whatever works! Hi I have a tax id number but I don,t know the address of the one I went to in greece and I need it for ebanking . Would you know the one for Americans that do not live in Greece? If you’re a Greek citizen abroad who never lived here but needed an AFM, it’s the expatriates’ office. If you’re any other citizen, it could be any of the ones on the list; it depends on where you initially registered. There isn’t a separate tax office for Americans or other citizens who live abroad. Note from Kat: No worries, George. After 15 years in journalism and four years online with this domain, I’ve seen, heard and experienced things most people can’t imagine. I appreciate your readership and kudos! Hi we have some residential land in Thessaloniki and for the last 5 years we have been trying to change it to our names since my mum passed away. My Greek lawyer states that she has completed all the necessary paperwork and is now waiting for the eforia to give her an antigrapfo. She stated that this is now out of her hands and we have to wait as there are thousands of cases that they have to go through. This has been a very frustrating process and I am not sure what to do next. Should I ring the eforia office, Should I get a new lawyer? Should I come to Greece and handle it in person? Please advise and keep up with the good work. I apologize for the delay in my response. I wanted to take an informal poll amongst people I know who completed property transfers in Greece between relatives (dead or alive) to get a sense of what they went through and how long it took. Lawyers don’t appear to make a difference, in fact people in my circle who didn’t use them got it done in less than a year. Some started the process in Greece, then finished the process at the Greek consulate back home. I’m not sure why it’s taking so long in your case. There’s nothing wrong with following up on your own if that gives you some reassurance, but you may not get a better answer, just as there’s no guarantee a new lawyer will be better than the one you have. I’m sure you’ve heard it before: “Edo Ellada.” Yes, things are getting better, but I’m sure you know this country and its population are digesting changes under an immense amount of pressure. It’s not an excuse, just reality. How do I find out if someone has tried to sell land my mother owns on an island in Greece. I have looked at all the real estate sites and found no sign of her property, but I have been told it was advertized and may have been sold. You need to inquire at the tax office and see if any transactions have been processed under her AFM. How do I find out Greece’s Tax Office Bnak details so I can pay an invoice for a block of land that my late dad had. It’s now officially in my name and have been sent an invoice to pay, but do not know where to transfer the money from Australia. I’ve been told I need – Bank Name, Address details, IBAN Number, Account Number and I simply just do not know how to get this information. Can someone please HELP ME! You’re having trouble getting this information because there’s no such thing as Greece’s Tax Office bank. Although I cannot see what you’re looking at, most invoices in Greece have payment options listed on the back. Wire transfers are typically facilitated by being a customer of banks that cooperate with the tax office or by signing up with a Bill Pay service. how can i find out if my tax rebate is ready? i don’t wont to drive all the way to greece from romainia just on the of chance. i finished working there in april 2009. thessaloniki to be exact. Refunds are typically mailed to whatever address you gave as your legal address. If you no longer live in Greece, you need to call the eforia where you were last registered. You need to have eforia in other countries for those that live overseas. It is simply too inefficient to go to a relative to do the job for you when everything can be done over the internet. And one should be able to get the key without hiring a representative in Greece. I really think it is a very user unfriendly process. I have an apartment in Greece (inheritance). The person that does my taxes said that he wrote that I live in it when I go to Greece. I do not stay in this apartment when I go. This apartment has shared ownership with the person that submits my taxes. What is the effect in my taxes if he writes that I stay there when I go to Greece? I feel uncomfortable with the statement for some reason. Am I responsible for the entire tax through the electric bill or only for half of it? This is not correct becaseu I neither go to Greece nor I stay there when I go. yet one of my relatives insists in maintaining utilities like electricity etc. Also can I mail the tax forms from overseas to the Expatriates Tax office in Metsovou? What address do I put? My address overseas? I am filing the tax forms E1 and E2 now as corrective tax forms because of an error my representative made and will mail them after the deadline because of the error. I am filing with the office for people overseas. If I want all the invoices to come to US, can I ask them? I do not want a representative in Greece anymore. Citizens who reside abroad go to Metsovou. The supervisor in mitroa is very unhelpful. I had to call her and, instead of giving me the answer to a straight question, she yelled at me. I think they treat us like second class citizens because we live abroad. I am not sure why I have to get harrassed by this lady when I have a question. The fact is that they messed up my tax forms. I agree. Even filing taxes online is a “new” innovation in Greece. There are a lot of inefficient and outdated processes keeping this country from moving forward and are partially responsible for other ills — corruption, tax evasion, poor infrastructure, waste, non-transparency, misinformation, closed marketplace, inflation, etc. In a word, crisis. As it says in “Greece’s new property tax,” the owner is responsible for paying the entire tax. If you qualify for an exemption, you need to file for one. The deadline for paper submissions was July 2, 2012. Only e-filings are being accepted without penalty until July 31. I cannot answer your other questions for legal reasons, as you did not provide enough information and I am not an accountant or lawyer. These questions should be posed to the person doing your taxes or another person with expertise you trust; or communicate directly with the eforia. Under the heading ‘Citizens that reside abroad,’ it already gives the Metsovou location. The majority of dimosio staff in Greece and at Greek consulates/embassies are unhelpful and rude to everyone on a daily basis. It has nothing to do with whether you live abroad. I wonder if you are able to recommend a reputable and competent Greek Tax specialist to advise on the below questions. I have contacted Deloitte Touche and PWC – both are quoting very high fees to answer the below. I wonder if you know of anyone (must know what they are doing) that may be more competitive. I look forward to receiving your reply. Thank you. I am a UK citizen and my wife is a Greek citizen. For the last four years, my wife and I have been living and working on a permanent basis in Singapore. All of our income originates in Singapore. We therefore pay our income tax in Singapore. 1. I understand there is a 25% witholding tax on dividends. Firstly, are we liable to pay the witholding tax on dividends? (the reason I ask is that Singapore does not tax dividends). Is this witholding tax taken automatically from the brokerage account or would we need to take action to pay it each Tax Year? If so, what action would we need to take? 2. What is the situtation concerning Capital Gains Tax for individuals? Would you please clarify this for people like us that are non-resident? Firstly, are we liable to pay capital gains (the reason I ask is that Singapore does not charge Capital Gains Tax) on any investment gains? If yes, at what % rate? If yes, how do we actually pay the tax – would we need to complete a Greek Tax return? Can we make payments remotely (i.e. from Singapore) by e-banking transfer? Or do we need to be physically present in Greece? 3. Would you please confirm, or advise otherwise, that we would, by law, need to file a Greek Tax return even if the property is not rented out so it is not generating any income. If this is true, what would we actually enter on the Tax Return and what Tax would we have to pay if the property is not generating rental income? I totally appreciate your response. Which is why, in my original comment, I stated clearly that what I was seeking from you was whether you were able to recommend a reputable and competent Greek Tax specialist that I could contact. I wasn’t looking for you to answer my questions – I am looking for a qualified, competent contact – if you have one. I’ve already contacted PWC and Deloitte Touche and they are expensive. Apologies for any confusion.